The Villas at Isleworth is an active lifestyle community located in Cranberry Township, PA. It is part of the larger community of BelleVue Park and it features low-maintenance attached homes, meaning residents won’t have to worry knowing their outdoor space is trim and clean. The community is conveniently located near many different restaurants and retail options as well as 30 minutes away from urban space in Pittsburgh. The Villas at Isleworth is home to a large, private clubhouse which features a multi-purpose room, billiards table, kitchen and an exercise room. The clubhouse leads outside to heated pool which is surrounded by a patio with lounge chairs and a grill. 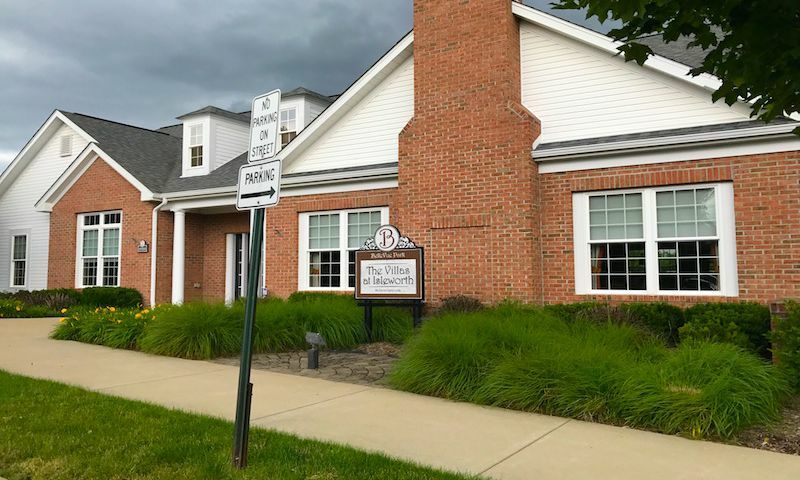 The Villas at Isleworth is located in the larger community of BelleVue Park, which means homeowners will have access to the main BelleVue Park clubhouse, which also features a multi-purpose room, exercise room, and heated pool. BelleVue Park is home to its own on-site retail, as well several community parks. Residents can also take advantage of a private entrance to nearby Graham Park, which features baseball fields, walking trails, and green space. Epcon started construction on The Villas at Iselworth in 2009. Now completed, the community includes 104 attached homes. These homes come in floor plans ranging from 1,716 to 1,816 square feet of living space. They have two or three bedrooms, two bathrooms, and a two-car garage. These homes include features like open floor plans, modern kitchens, and cathedral ceilings. Homeowners at The Villas at Isleworth can participate in swimming, exercising, and various community events, including ice cream socials, pizza parties, and Oktoberfest. Residents can also participate in events help in BelleVue Park, including yard sales, Easter egg hunts, holiday light walks, and more. The homeowner’s association fee covers lawn mowing, snow removal, and general outside maintenance, helping homeowners live a maintenance-free lifestyle. The Villas at Isleworth is located in a prime location for active adults. Located just down the street from Cranberry Township’s commercial center, The Villas at Iselworth has quick access to Walmart, Costco, and Cranberry Mall. Nearby is Panera Bread, Buffalo Wild Wings, Olive, Garden, and various independent restaurants. UPMC Passavant Cranberry is nearest medical center, while CVS and Walgreens are just a five-minute drive away. The Villas at Iselworth is also conveniently located next to Interstates76 and 79. From there, downtown Pittsburgh is only a half hour away. Pittsburgh is host to a number of restaurants, entertainment options, and museums. It’s also host to three professional sports teams, meaning residents will only have to make a short drive to see the Steelers, Penguins, or Pirates. Pittsburgh International Airport is nearby and offers flights across the world for those looking for a getaway. All this truly makes The Villas at Isleworth a great place for anyone looking for a maintenance-free home in Cranberry Township, PA. Homeowners will have access to private, modern amenities. There are plenty of activities available in The Villas at Isleworth. Here is a sample of some of the clubs, activities and classes offered here. These homes come in floor plans ranging from 1,716 to 1,816 square feet of living space. They have two or three bedrooms, two bathrooms, and a two-car garage. These homes include features like open floor plans, modern kitchens, and cathedral ceilings. 55places.com is not affiliated with the developer(s) or homeowners association of The Villas at Isleworth. The information you submit is distributed to a 55places.com Partner Agent, who is a licensed real estate agent. The information regarding The Villas at Isleworth has not been verified or approved by the developer or homeowners association. Please verify all information prior to purchasing. 55places.com is not responsible for any errors regarding the information displayed on this website.